With the 2018 Honda HR-V’s technology, you can have a better handle on what’s going on around you as well as a more pleasant driving experience. This versatile crossover SUV is designed to provide the right balance of available entertainment and driver assistance features to make every trip your family takes around Boulder better. A touchscreen audio display gives you access to a host of apps and fun. Innovative technology like Honda LaneWatch lets you move safely through highway lanes. A live navigation system makes it easy to explore new destinations. What features make improve your daily drive? Your favorite music without commercial interruption? Directions to new spots all over the Front Range? The new Honda HR-V can give you all that and more. Satellite-Linked Navigation System: Standard on the EX-L Navi, you’ll have live updates to your route with consideration for traffic and weather patterns for timely arrivals. Touchscreen Entertainment: The 7-inch display included with the EX trim level and above works with HondaLink to let you integrate your smartphone, and select apps like Pandora let you stream music. You can also select a station from SiriusXM Radio. Comfort in the Cabin: Dual-zone automatic climate control, heated seating, and a one-touch power moonroof all help you get just the right settings to better enjoy your time on the road. Peace of mind is within reach thanks to advanced technology that lets you know if an accident is about to occur. These systems can help you can avoid a collision, and select design features even let you get in and go quicker. Multi-Angle Rearview Camera: Standard on every model, it’s easier to backup into a parking spot or leave a driveway on a busy street thanks to this dynamic view. Honda LaneWatch: Standard on the EX trim and above, a small camera installed in the passenger side view mirror lets you get a glimpse of what’s happening in your blind spot so you can switch lanes easier. Push Button Start: When you choose the EX or the EX-L Navi trim, you won’t have to dig for your keys. As long as you have them on you, just start the engine with the push of a button. You can schedule a test drive of the new Honda HR-V by calling our sales team at (303) 245-6417 to set up an appointment. 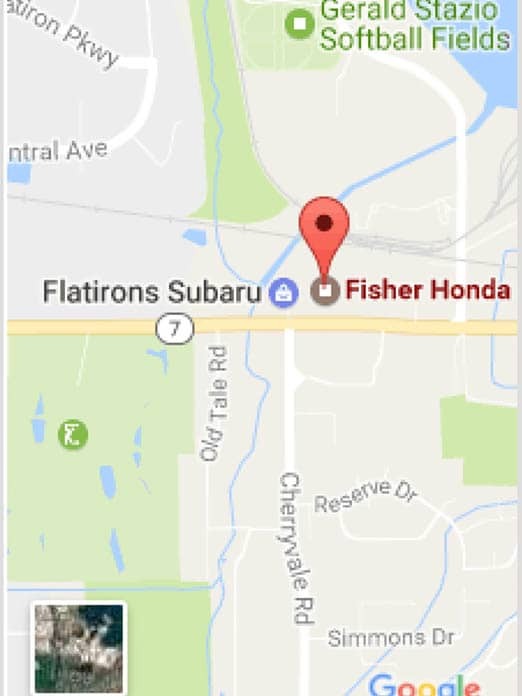 From our speedy service center to our helpful in-house financing, Fisher Honda has everything you need to stay happy behind the wheel. Visit our dealership at 6025 Arapahoe Road in Boulder, CO, or leave a message online if you have any questions!